In March 2016, the City of Kawartha Lakes Council approved the restoration of the City Hall. In September and October 2016, we supplied 86 squares of our North Country Unfading Black slate roof tiles (24” x 12” x ¼”) for this slate roof replacement project. 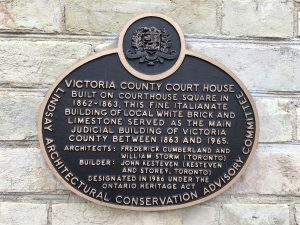 Originally built in 1862-1863 as the Victoria County Court House, this Italianate style building was designed by architects Frederick Cumberland and William Storm whose firm was one of the most prominent in nineteenth century Toronto. They used local white brick and limestone for the exterior. 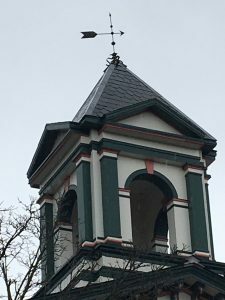 The building was renovated and the bell tower was removed in 1971 and replaced in 1987. 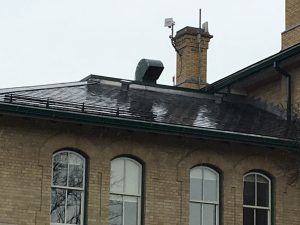 The City Hall building structure was deteriorating and a 2007 roof condition survey stated that the flat roof portion and slate roof would need to be replaced by 2013. An architect was hired in 2014, and noted the immediate repairs included; new slate and flat roofs, repairs to isolated cracks in the brick veneer, replace wooden window sills, windows, skylights and curtain walls. 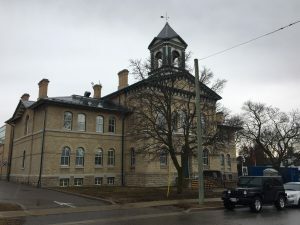 In July 2016, the city Council approved a $1.2 million dollar budget to preserve the heritage of the building which was designated in 1986 under the Ontario Heritage Act. If you are replacing an old slate roof, it’s best if you can remove a piece and look at the back of the slate to see what the original color was. Roofing slate is available in unfading and weathering. If it is a weathering slate, the color on the face of the slate may appear brown and tan. Some pieces may weather more aggressively depending on their exposure to the elements. Roofing slates are available in an assortment of sizes. For this reroof, a 24” L x 12” W x ¼” thick was supplied. This size when installed with a 3” headlap will have a 10.5” exposure. A 24” x 12” slate has 115 pieces per square and the weight is approximately 900 Lbs per square. For our Schedule of Standard Sizes please visit our website’s FAQ section.